A beach attached to the tourist complex of Port El Kantaoui near the city of Sousse in central Tunisia has been attacked by gunmen. Dozens of people have been reported killed and injured. UK's Foreign Office confirms 15 British nationals died in the attack on the beach outside the Imperial Marhaba hotel Friday. The victims of Friday's Tunisian beach resort shooting are mostly British. However, other Europeans are also among the victims. “The majority are British,” Tunisian Prime Minister Habib Essid told a news conference. “After [this] come[s] the Germans, then the Belgians and then other nationalities,” he said, adding that there were also French nationals among the victims. The “exceptional plan to better secure tourist and archaeological sites” will include “deploying armed tourist security officers all along the coast and inside hotels from July1 ,” he added, according to AFP. Thomson and First Choice travel have canceled all this week’s flights to Tunisia following the deadly terrorist attack. “Thomson and First Choice are deeply shocked and truly saddened by the events and we are grateful to our staff on the ground and the emergency services who are working hard in an incredibly challenging environment,” its statement read. Tunisian Prime Minister Habib Essid has revised the death toll from 39 to 38 people, according to AFP. The previous figure included the dead gunman. There were three attackers in the Tunisian massacre, Interior Ministry spokesman Mohammed Ali Aroui told reporters. One of the men was was killed, one was arrested and another escaped. One of the attackers was a young student not previously known to authorities, Rafik Chelli, the secretary of state of the Interior Ministry, told The Associated Press. 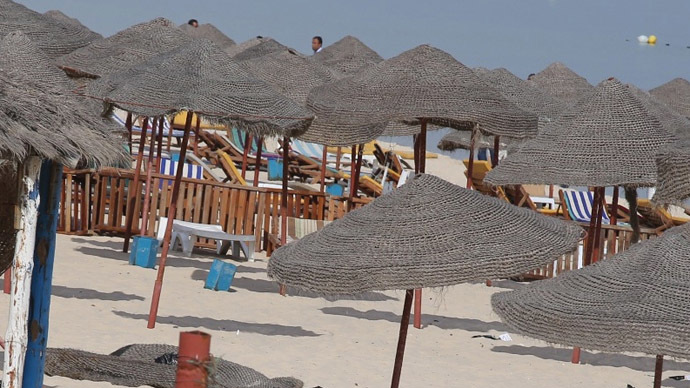 In light of Friday's beach massacre, some 80 mosques outside state control will be closed down to prevent the possible incitement of violence, the Tunisian government has announced, according to Reuters. Holiday maker Thomas Cook will not refund any holidays booked for Tunisia that are due to start after July 4. Tunisia cannot cope with the international extremism threat on its own, said President Beji Caid Essebsi, calling for a global strategy to tackle the terrorists. The Islamic State terrorist group has claimed responsibility for the deadly attack on tourists at a Tunisian beach which claimed at least 39 lives, Reuters reports citing social media accounts associated with the jihadists. "Our brother, the soldier of the Caliphate, Abu Yihya al-Kairouni, reached his target the Imperial hotel despite the security measures," the statement said. It said he had attacked a "bordel" and killed "infidels'.